Buying a new watch is always a big deal, especially when are someone who looks at the brand image. 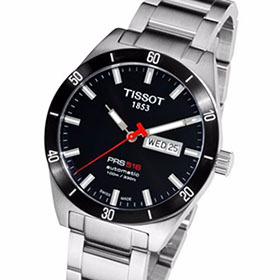 Tissot is a famous Swiss watch brand that has gained worldwide recognition and now offers products in 150 countries. With a humble beginning from the Swiss Jura town, this company has reached remarkable heights due to consistent innovation. Their solid reliability can be hardly matched by other watchmaker. Are Tissot watches good? If you’re looking forward to buying a Tissot watch, doubting about their quality and don’t know which one to choose. Just take a look at this Tissot watches review of five bestselling Tissot watches. These watches don’t cost a fortune and would look splendid on your wrists for every occasion. Pros: 1. A elegant and beautiful watch, at a great price. 2. Has the perfect blend of simplistic design and classic round dial that looks splendid. 3. Can complement both formal and informal attire because of its versatility. 4. Has water resistant capability to keep you safe from unforeseen circumstances. Cons: 1. The clasp is a little finicky. 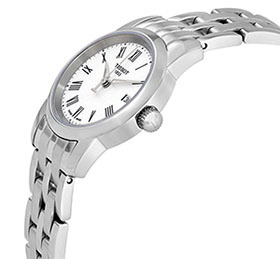 The Tissot Men’s T-Classic Tradition Silver Dial watch doesn’t break any rules when it comes to design. It also doesn’t try hard to make an impression. Anyone who knows anything about watches already knows the value of a Tissot model and what the company has accomplished. This brand has become one of the most renowned names in the world for watches like this one. Staying true to the classic theme, the company brings you a model that appeals to old-school watch lovers. People who like their models to be very basic and not overcrowded with many features would adore this watch. Since there are already many popular watch brands making feature enriched watches, this product is just an example of the focus on the classic theme. This watch features a round sapphire round window that perfectly complements the analog display. The case is made of stainless steel and the band is crafted out of genuine leather. It is very comfortable to wrap around your wrists. There is a date window located at 3 o’clock and a deployment buckle style clasp for optimum comfort. 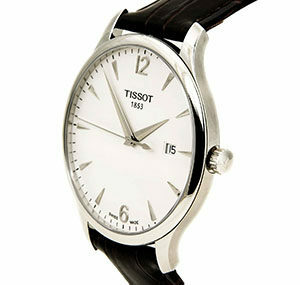 It’s hard to find quality surpassing Tissot, and you’d certainly feel the difference as soon as you wear it. This is a men’s dress watch that would compliment you in various attire. Stay ready to attend formal and casual outings with utmost grace once you are wearing this watch. This exquisite model certainly has a niche appeal that makes it stand out from the rest. Pros: 1. It's simple, sleek, classy and elegant. 3. Features a highly stylish stainless steel band with super easy deployment clasp closure. 5. Water resistant to 100 meter/330 feet, which makes it suitable for snorkeling and swimming. Cons: 1. If you don't wear it every day,it will lose time or even stop. 2. May be too heavy and big for some people’s wrists. Tissot Men’s T0444302105100 PRS 516 Watch is another fantastic product that speaks volumes about the company’s craftsmanship. It has many features and little details that would make the watch appealing to men, especially those who love simplicity in design. People also appreciate the value a brand name carries. This imported watch features a stainless steel case with a pitch black dial having numbered bezel and rectangular hour markers. The date window at 3 o’clock lends some additional dose of utility that is always important. The 42 mm stainless steel case, complemented perfectly by the antireflective sapphire dial window makes this an even more valuable purchase. The window scratch resistant feature is no less than remarkable that one can’t help but appreciate. This watch has a Swiss automatic movement with analog display, so you never need to change batteries. The band is made of stainless steel, which is a favorite among men and has been for a long time. And the makers has been crafted to almost perfection. The silver and black color combination has already proven to be a hit in other watch models, and this is no different. You can expect to get the finest quality watch when you buy this model. This is the reason Tissot commands so much respect in the watchmaking industry. Go ahead and try it out for yourself and then decide how much this model is worth to you. Pros: 1. Outstandingly sporty, technology-oriented design. 2. Gorgeous and elegant, high quality watch with great attention to details. 3. The robber band is soft and doesn't irritate your arm. 4. Provides excellent water resistant capability to 100 M (330 feet). Cons: 1. May be a little heavy for some people. 2. The silicone strap will get older or even tear up after a while. The first thing you’d notice in the Tissot Men’s T0484172705700 T-Race Black Chronograph Dial Watch is its enriched feature design. The “Race Black” name for a reason stands for those interested in technology and life on the fast lane. 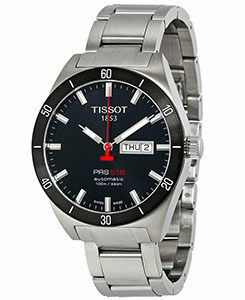 Like most other high-tech watches from Tissot, this one too comes with advanced functionality and many subdials. Some features that make it exceptionally appealing are its black dial, stainless steel case and silver toned luminescent hands. There is also stainless steel snap-down case back that all combine to form a fantastic looking wrist wear. 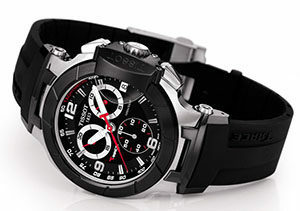 As Tissot is officially the timekeeper of NASCAR, this model has been built to keep pace with the recent trends. The T-Race Black Chronograph Dial is the biggest indicator of the company’s new commitments. The 45 mm stainless steel case goes perfectly with the watches black rubber straps to reflect its sporty roots. The date display window can be spotted at 3 o’clock while the minute sub-dial is located at the 10 o’clock position. The Arabic hour markers, Tachymeter, Sapphire crystal display, and many other exciting features make it an ideal choice. If you have been looking for a watch that complements your active lifestyle, then this model would be the best option. Furthermore, you can also wear this watch to parties because versatility is another of its strong points. Pros: 1. Simple and classic design. 3. Has a very expensive feel to it. Just the correct combination of simplicity and classiness. 4. Anti-reflective sapphire dial window. 5. Water Resistant up to 30 m (100ft). Cons: 1. If you have a thin wrist, you may need to adjust the size to fit. 2. Requires you to switch date at the end of every short month from 31st to 1st. 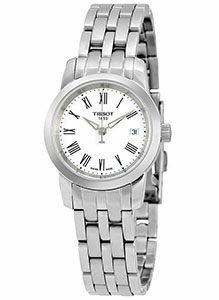 Tissot Women’s TIST0332101101300 Dream Watch has a stylish and expensive looking. 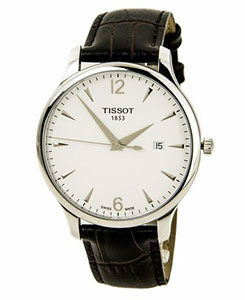 It is made by the well known Swiss watch brand Tissot who is famous for their high end watches. It has a silver tone featuring a white dial with Roman numeral indices and has a date window at 3 ’O Clock. This watch features a quartz movement with analog display. And the 28mm stainless steel case features an antireflective and scratch-resistant sapphire dial window. The round case is just the right size to make it the perfect accessory for your wrists. There’s also a five link stainless steel bracelet with a fold-over clasp giving you the ultimate classy look. It is water resistance up to 30m (100ft). It means this watch can withstand splashes and small immersions but is not suitable for swimming. Additional, the shining white dial goes very well with the overall silver finish of this watch. The Roman numeral hour markers add to the elegance and are complemented by the silver toned hands. With water resistance of 30 m, you will not have to worry about spilling water on it. Overall, it is a great piece of accessory for all the ladies out there who like to add a touch of class to their aesthetics. It suits various attire and sets you a class apart from the rest with an elegant look. Pros: 1. An entirely Swiss made watch featuring Swiss movement from a reputed and trusted maker. 2. Scratch resistant sapphire crystal. 3. A lovely, classy watch. Gives an expensive and sharp look to the wrists and goes along very well with formal attire. 4. Water Resistance up to 30m(100ft). Cons: 1. The date window is a bit too small and sometimes hard to read. 2. The links on the bracelet are not very sturdy. Comes off often. 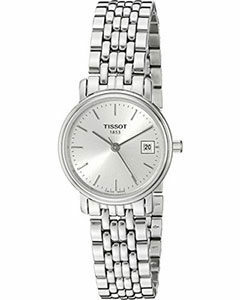 The Tissot T-Classic Desire watch is for all those ladies out there who love to keep it classy and elegant. This watch gives an exquisite look and feels to your wrists so you can gleam of confidence all day long. It is an imported watch that features Swiss quartz movement with a brilliant display. There’ a 24mm stainless steel case with a scratch-resistant sapphire dial window. The stainless steel bracelet with a jewelry clasp closure giving an elegant, charming look to your wrists. With the sleek case featuring a stainless steel bezel, the watch looks sharp and smart at first sight. A sapphire window shields the silver-toned face of the dial which features similar silver-toned hour markers. A date calendar is also added at the 3’O Clock position for added convenience. It is water resistant up to 30m (100ft). In general, it can withstand splashes or brief immersion in water, but not suitable for swimming. 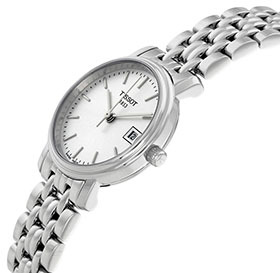 In a word, T-Classic Desire is a Swiss brand watch of Tissot that you can trust with your eyes closed. So just get these for yourself to add more class to your magnificent self. Investing in watches can be a great complement to your usual dressing styles. A great looking watch is a must because it gives an overall added completeness to your look. If you are looking forward to buying one for yourself or as a gift. A trustworthy and elite brand is what you should be looking for. 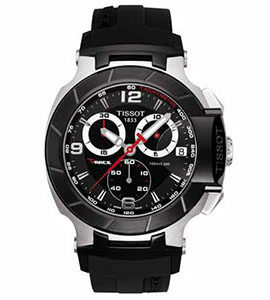 Tissot is a world renowned Swiss watch brand and their watches glow of class and elegance. Be it for men or women, watches by Tissot are works of art. And the above five watches in this Tissot watches review are no different. So go ahead and gift yourself one of these, or make a present to someone.